Spice up your cooking with spirits. Techniques for—and jokes about—cooking with wine seem to abound these days. I’ve stopped counting the number of notepads, pieces of clothing or fridge magnets I’ve received emblazoned with the slogan: “I love to cook with wine. Sometimes I even put it in the food.” Substitute the word “beer” for “wine” and you have a similar, if slightly less bountiful, largesse. Why is this? I blame the fact that there exists no national cuisine to champion the use of spirits in the kitchen. Sure, the Scots and the Irish like to use a dram of whisky here and there, and the Dutch aren’t averse to the addition of a drop of genever to a stew or braising liquid, but no one nation stands up for spirited cuisine the way the French do for cooking with wine or Belgians do for la cuisine á la bière. Even Caribbean nations, with their remarkable rums and rum culture, don’t bring the bottle to the kitchen much. Perhaps the United States is positioned to become the world’s advocate for cooking with spirits. The question then becomes one of which spirit to use. And while personal preference should obviously be a factor here—there’s no point adding gin to a sauce if you hate the taste of it—so, too, should you be guided by the nature of the dish. A full-bodied, aged rum or Bourbon, for example, will blend more harmoniously with big flavors like rare beef and Cajun spice than with lighter fare such as poached whitefish or a fluffy omelet. Change the spirit in question to potato vodka or a particularly herbaceous gin, on the other hand, and the affinities will likewise switch towards less potently flavorful foods. One way to test the spirit you’re planning to use is to sip a little alongside a taste of the principal ingredient in the dish and see if the two are complementary. If you want to make a Bourbon sauce for a steak or flavor a chocolate cake with rum, for example, you can cook a mouthful or two of the meat or break off a chunk of the chocolate and try it with the spirit first. If it tastes great in the glass, chances are it will also be good on the plate. Alcohol content must also be considered, since unless a dish is cooked for a lengthy period of time, some of the spirit’s strength will remain. Even when indulging in the fiery practice of flambéing, some 75% of the alcohol will linger in the dish, according to the U.S. Department of Agriculture, as cited by John Rose in The Vodka Cookbook (Kyle Books, $25). In fact, the USDA estimates that it takes as long as two and a half hours of simmering to cook out all but 5% of the alcohol content of a rum, Cognac or other spirit. Rose’s point is undoubtedly true, but also illustrates the way in which, much like water and milk, vodka serves better as a cooking medium than it does a flavor. While the alcohol contained in vodka will “tenderize meat by breaking down tough fibers,” it will also add little taste to a dish, short of lightening the weight and adding a bit of alcoholic “oomph” to the classic vodka sauce. This may be why the vast majority of Rose’s recipes use infused vodkas rather than the plain spirit. Between the robustness of aged rum and Bourbon and the delicacy of vodka lie spirits both brown and clear that are blessed with more moderate flavors, from Irish whiskeys to Dutch and Belgian genevers and Mexican Tequilas. While these spirits tend to be used most often in regional fare, such as a Tequila-spiked salsa or the whiskey that defines Cockles and Mussels Molly Malone, their judicious use can elevate cuisines of all sorts, providing that the alcohol’s principal flavors are kept in mind. A bit of genever or gin can add a most enjoyable kick of juniper to sauerkraut. Similarly, the subtle fruitiness of a Poire William punches up the taste of a fruit sorbet. If balance and restraint are the order of the day, the sky is pretty much the limit for these highly adaptable spirits. In cooking as in dining, liqueurs such as Kahlua, Grand Marnier and Frangelico are best employed at the end of the meal, since they add not just flavor, but also sweetness to the dish. For this reason, Mitchell urges extreme prudence when adding them to an existing recipe for the first time, and confines their use almost exclusively to desserts. Because of their elevated alcohol content, even the readily apparent flavors of liqueurs can dissipate rapidly when exposed to heat and air, she says. It is “sometimes desirable to remove the pan from the heat when stirring in a liqueur,” particularly in desserts like her Apricot Brandy Pound Cake, in which the alcohol taste is part of the dish’s appeal. Whether for novelty or utility, spirits have a necessary place in the kitchen. From using a vodka marinade to tenderize a tough piece of beef to a drop of whisky for flavoring a stew, what ends up on the plate should be all the better for the spirited path it took to get there. Adapted from a recipe by Chef Chris Howerton, Equus Restaurant, Louisville, Kentucky. To make the dressing: In a small saucepan set over medium-low heat, cook the Bourbon until it is reduced in volume by half. Let cool. Combine the cooled Bourbon, vinegar, oil, shallots, egg yolks and honey in a blender and blend on high until emulsified. Refrigerate until ready to use. When you are ready to serve, toss the greens with enough vinaigrette to coat the leaves. Divide between 4 salad plates. Divide the peach and red onion slices between the salads and sprinkle each with pecans. Serves 4. Drink Recommendations: Howerton recommends pairing this salad with a fruity Gewürztraminer, an effervescent, Belgian-style strong golden ale or a reverse Bourbon and cola, where the normal proportions are reversed so that four parts of rich Bourbon are mixed with one part of cola. Adapted from The Spirited Vegetarian: Over 100 Recipes Made Lively with Wine and Spirits, by Paulette Mitchell. Preheat the oven to 375Â°F. Place the squash halves, cut side down, on a foil-lined baking sheet and bake for 45 minutes or until tender. Let cool and remove pulp with a spoon. You should have about 2 cups. Preheat the oven to 350Â°F. Spread the walnuts on a baking sheet and bake for 5 to 8 minutes or until the nuts jut begin to color and become fragrant, watching them carefully so they don’t burn. Remove from the oven and transfer to a bowl to cool. Melt the butter in a Dutch oven over medium heat. Add the pear and onion, cooking until tender, about 10 minutes. Add curry powder and stir constantly for about 30 seconds. Stir in squash pulp and vegetable stock. Increase the heat to high and bring to a boil. Reduce the heat to low, cover and simmer for 20 minutes. Remove from the heat and allow to cool for a few minutes. Purée the soup with an immersion blender or, working in batches, transfer it to a blender and blend until smooth. If you’ve used a blender, return the soup to the pot. Stir in the half-and-half, Cognac, salt and pepper. Cook over medium heat, stirring constantly, until it is warmed through, taking care not to let the soup boil. Add salt and pepper to taste if necessary. Serve in soup bowls garnished with walnuts. Serves 6. Drink Recommendations: “Creamy” and “sweet” are the key factors in this dish, which incline one to pair it with a contrasting taste, such as the crisp acidity of a Sauvignon Blanc, the sharp hoppiness of an American-style pale ale or the dryness of a moderately smoky Speyside single malt, diluted with spring water to about 50 proof. “Strannik” (pronounced stra-neek) is the Russian word for hobo or wandering soul, and refers to the traditional campfire-style cooking of this dish. (It can be made in the oven if you’re not inclined to go camping.) The recipe is adapted from The Vodka Cookbook by John Rose. Season the salmon well with salt and pepper, place in a sealable plastic bag with the lemon vodka and olive oil and marinate in the refrigerator for about 1 hour. Meanwhile, lay out 2 sheets of heavy-duty aluminum foil, each about 2 feet in length, one on top of the other. Place the carrot slices in a single layer in the center of the foil, and add the shallots and garlic. 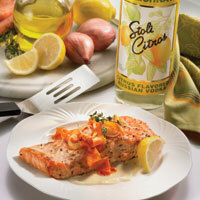 Remove the salmon from the plastic bag, discarding the marinade, and place fillets on top of the shallots. Season the fillets with more salt and pepper, drizzle with lemon juice, and top each with butter and thyme. Pour white wine over the whole lot and drizzle with the cream. Lay a third length of heavy-duty foil over the top and tightly roll the edges of the sheets together on all sides, snugly enclosing the contents. Then enclose the whole pack in a final layer of foil and refrigerate until ready to cook. Clear a place among the white coals of a campfire or grill, or preheat the oven to 300°F, and place the packet in the cleared area (or oven), enclosing but not covering it with glowing coals. Cook for 30 minutes or until the salmon is firm and opaque, but still tender. Remove from the coals (or oven) and open, taking care to avoid the hot burst of steam as you break the seal. Serve garnished with lemon wedges to squeeze over each portion. Serves 4. Drink Recommendations: If you do cook this in a fire, some smokiness is bound to blend with the lemon of the vodka and the richness of the fish, butter and cream, making the dish a natural match for a fruity, smoky New World Syrah, a British-style porter, or a wheated Bourbon, served in a rocks glass with an ice cube or two.